The country house Tre Acque is a charming house, nestled in the hills with a large terrace in front and all along it with a panoramic view over the green valley of 'Tre acque' and just above Biodola, Scaglieri and Forno wonderful beaches.The house's name derive from the presence of three smalls springs right beside the house that merge into the river called "Tre Acque", from which the name of the house and the valley is originated. The house is situated in the middle of 5 acres of private estate, surrounded by pine trees and Mediterranean bush, the typical Tuscany canopy. The large terrace is equipped with deckchairs, table, outdoor chairs, outdoor shower and, just beside it, a greenhouse with bench and hangs, where guests can dry beach towels and bathing suits, ; a roofing with barbecue and a large dining table. From this terrace guests can go directly to the kitchen and to the living room. The living room offers three comfortable sofas, a TV, a DVD and CD player, a fireplace and rich and large library. Kitchen is completely furnished with everything guests will need to cook their own meals. There are four bedrooms. Upstairs you will find the main one, which is furnished with a king size bed, a library and a table and right beside, you will find, the second one with two single beds, one a bit shorter, and finally a large bathroom with tub and shower. In an annex to the house you will find the third bedroom with three single beds and a bathroom with shower. And finally the last bedroom is in a second annex with a double bed. You can go in the two annexes from the terrace. There are 2 cots and 1 high chair for babies. It is perfect for two families. Smoking is allowed only outside the building. The house is exposed to east, so it is mainly fresh and breezy. The large wood land round the house has been cleared, so the woodmen will pass with the wood truck twice a day. They are very friendly and they are expert on Elba flora and fauna. You can promenade in and have picnic there. The country house is very close to some of the most beautiful beaches of Elba as Biodola (m.800), Scaglieri, Forno, and Campo all'Aja, Procchio, Magazzini, Capo Bianco, few km. away. From the house with a little longer drive you can reach many other beautiful beaches either natural or equipped with beach clubs and restaurants nearby the sea, as Fetovaia, Capo S.Andrea... where the nature changes and becomes wilder and the climate more sunny and dry. It can be amusing to change beach every day. You may relax, swim, sail or kayaking in the Gulf of Procchio and in the various beautiful beaches of the islands; you can also ramble on foot trough the many beautiful path, some of them that run into ruins of beautiful roman villas. You can also do a day long trip with special ferryboat to visit the other wild and interesting islands of the group: Pianosa, Capraia, Montecristo, Giglio, Giannutri. The cultural life is very alive in the island: concert in the magic village of Campolofeno, litterary and journalism prizes in Marciana and other villages. You don't have to forget to visit the emperor Napoleon's homes in San Martino, close to the house, and in Portoferraio. In summertime every Sunday there are feasts in the villages with colored markets and typical tuscan food. All villages but especially Portoferraio, Marina di Campo and Porto Azzurro are renown for their fashionable shops and boutiques for a pleasant shopping. Just above the house there is a pizzeria/Restaurant “Retro Gusto” with a large terrace, from where you can admire beautiful sunset on the sea over the Biodola and see on the skyline the island of Capraia. The nearest supermarket is Conad in Carpani, 5 minutes drive, and in Portoferraio, "industrial area",Conad Super Store and Eurospin, bigger with a lot of choice and very good prices, 10 minutes drive. At your arrival Gabriella and her husband Piergiorgio will wait for you at the house and show it to you; you will have to show them your identity card original and give them a copy. If it isn't already payed through the site, you have to give them: € 150 for cleaning, € 200 for deposit, € 15/person for sheets and towels if you have requested it. They will be available for you during the whole holiday for any problem concerning the house. The ferry company Blunavy offer 20% discount on the ticket to the house guests trough vouchers that will be sent, if requested. I'm the oldest of five sister and we own this property in Elba, inherited by a very dear aunt. I'm psychologist and psychotherapist and I work in the Direction of Social Policy of Genoa municipality. I'm married with a daughter 27 years old. I spent many pleasant holidays in the house of Tre acque, where I have many dear friends, coming to Elba every holidays. The country house "Tre acque" belongs to my family since fifty years. When I was a teen ager, I spent there interesting and serene holidays with my aunt and uncle, which left to me and my sisters this property. Then I spent there wonderful holidays with friends, some of them coming to Elba sailing and sometimes we went back from Elba to Portofino on sailing boat. Years later I spent there pleasant and serene holidays with my family and friends with sons and daughters. The house is very quiet, plunged in the mediterranean bush but nearby there are the most beautiful beaches and alive villages with cafes and restaurants and the joyful crowd of summer evenings. I love this house, where I lived happily in each period of my life. The house is very fresh and quiet wthin the nature and it’s very pleasant to wake up in the morning and have breakfast on the terrace, admiring a beautiful panorama or having a shower and a relax on the fresh terrace, watching the beautiful view in the silence, after being in the sunny, crowded beaches. Bathroom 1: Toilet, Bath and Shower Enclosure, Bidet; Bathroom 2 Toilet, Shower Enclosure, Bidet; Outdoor Shower with walk in closet for bathing suits and towels. In the outdoor area in front of the garage is possible to park 2 cars. An eat in kitchen and an outdoor large dining area with a wooden table, benches with cushions and chairs and big barbecue on the terrace. In almost every beach you can rent a kayak to explore the wonderful rocky costs of the island. In Portoferraio harbour you can rent a motor boat to reach lovely beaches and rocks, inaccessible by car, to swim in beautiful turquoise water. Easy to play tennis or to have tennis training at the Hermitage Hotel, Biodola or at the Hotel del Golfo, Procchio. You can play golf at the Hermitage Hotel, Biodola, and the Golf Club Acquabona. Notes on accommodation: The bedroom 4 it's detached from the whole busunbedsilding and is served by the same bathroom of bedroom 3. The house is surrounded by lawns. Outdoor dining table, barbecue, easychiars, sunbeds. The house can be heated during the winter and middle seasons. Utility Room: Washing machine, drying rack inside and on the terrace, washbasin, iron, ironing board, 1 extra refrigerator. Cleaning / Towels / Linen / Maid service: Linens Provided, Towels Provided ( € 15/person), Housekeeper Optional Final cleaning indispensable (€150). 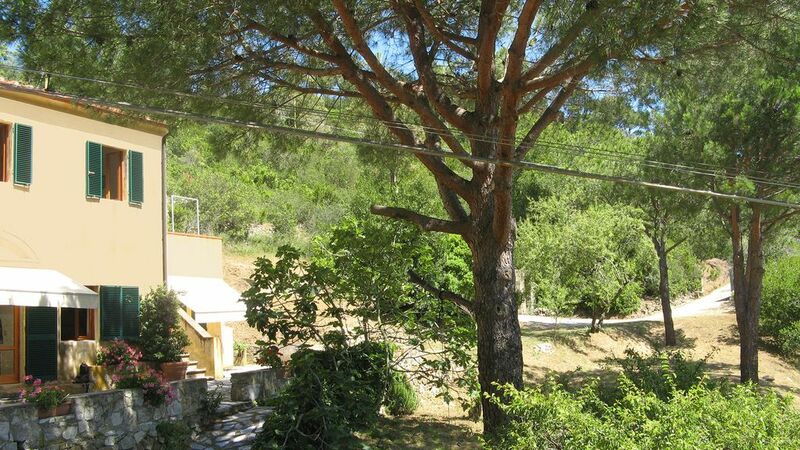 The house must left not clean but in perfect order (extra charge € 50) Other: In front of the house there is a big sunny and shady terrace between pines with a view on the valley and faraway the sea and a meadow with a large table with benches and chairs to dine in the open air. We had a wonderful and very relaxing stay at Elba Island. The place is very quiet and away from everything and that's what we were looking for. Obviously one needs a car as the next village Portoferraio, a nice ancient harbour where you could shop everything, is 8 km away. By car we love to have a trip around the Island to discover beautiful beach, every day different. But the nearest, Biodola, is one of the best in the world: I suggest to wait sunset there, it’s beautiful. Il nostro soggiorno è stato breve ma piacevole...più che una casa è un casolare immerso nel verde e quindi si trova in un contesto rilassante ed è davvero vicino alle più belle spiagge dell'Elba...La casa è molto spaziosa e ben equipaggiata. La dislocazione delle camere (due nel corpo centrale e due con accesso separato) può essere un vantaggio per avere una privacy maggiore! Unico consiglio che darei alla proprietaria (una signora gentilissima) è di sostituire i fornelli perchè fanno poca fiamma e per cuocere il cibo ci vuole un bel pò di tempo ....! Sono felice che abbiate un bel soggiorno alle Tre acque e spero che ritorniate per un periodo di vacanza un po piu lungo...con un relax maggiore!! Ho cambiato i fornelli lo scorso anno ma....li faro verifacare dal tecnico e grazie per avermelo ricordato!! Nous avons passé un superbe séjour en famille cet été sur l'Ile d'Elbe. Une découverte ! Ile magnifique, encore très sauvage (des sangliers nous réveillaient la nuit !) et un vrai dépaysement... La maison est très bien placée, à proximité de la Biodola l'une des plages les plus charmantes de l'île. Pas loin non plus de Portoferraio, pratique pour les courses etc. Au milieu de la nature et des pins, cette vieille maison de famille nous a tous charmé. On sent une belle histoire de famille avec tous les livres et les photos du bon vieux temps. Les petits moins (peu nombreux) : on entend un peu la route la nuit (même si elle est assez loin), et les moustiques se manifestent le soir (mais la maison est bien équipée pour lutter contre eux)! Nous reviendrons avec plaisir car l'accueil de Maria Adèle et les bons services de Gabriela nous ont offert un très bel été... Merci encore ! Je suis heureuse que votre séjour a était très bon et que vous veuillez revenir et j'espere que aussi d'autre familles veulent faire cette belle expérience de vacance!! Nous avons passé une semaine merveilleuse dans cette charmante maison. Elle est idéalement située sur l'île, proche à la fois de Portoferraio et de Procchio, d'où on peut traverser l'île en moins de vingt minutes et de là atteindre la côte sud-ouest avec ses extraordinaires routes panoramiques et ses endroits de baignades magiques. Elle possède une très belle terrasse, équipée pour la sieste et munie d'une douche extérieure (très appréciable au retour de la mer ! ), ombragée par des pins magnifiques et fleurie. Le coin à manger dehors est très plaisant, doté d'un barbecue à côté. La cuisine est parfaitement équipée, le salon est charmant et possède une bibliothèque multilingue intéressante.Nous avons reçu la maison dans un état de propreté irréprochable; Madame Gabriella et son mari, qui s'en occupent sur place, nous ont réservé un accueil des plus sympathiques. Nous étions 6 personnes en tout, dont deux couples. Les chambres à coucher du corps principal de la maison conviennent mieux à une famille avec petits enfants, car l'accès à la salle de bain pour la deuxième chambre se fait par celle des parents. C'est un tout petit bémol dont nous nous sommes très bien accommodés. Nous ne pouvons que recommander très chaudement ce séjour. Autre point: la communication avec la propriétaire est très fluide et ponctuelle, merci. La vacance est tres precieuse et je suis très heureuse que vous avez très bien passé votre vacance à la maison o Tre acque et j'espère que d'autres familles et group d'amis aimerons passer ici leurs vacances et apprécier la maison et la beauté de l'île d'Elba. Un bellissimo soggiorno in un ambiente rilassante e tranquillo. Non appena arrivati ci siamo subito sentiti a casa. L'accoglienza di Signora Gabriella e famiglia era gentilissima. La Casa era fresca e tutto pulitissimo. La terrazza è diventata il nostro punto d'incontri famigliari , con tanti momenti rilassanti e grande grigliate. Abbiamo sentito il profumo del bosco e vissuto momenti bellissimi di luce e sole. La casa è semplice ma ben arredata e confortevole. La cucina ha tutto il necessario. Siamo stati bene anche se per purtroppo poco tempo. Ritorneremo! We have had a beautiful holiday in Biodola. The house was comfortable and clean, the kitchen fully equipped. The terrace was our point of living from sunrising to warm evenings. I will surely come back because it felt truly home. Thank you Mrs. Adele Serra and a big thank you to Mrs. Grabriella which helped us a lot over our stay! Spero davvero nel vostro ritorno e che altre famiglie come la vostra vivava una piacevole vacanza alle Tre acque. I wish really that you will come back and that other family can pass fantastic holiday at the Tre acque!! Biodola, Scaglieri, Forno,10 minutes drive, 30/40 minutes walk. Hotel Hermitage, Biodola: barbecue soirèes, dancing, swimming pool, golf, tennis court. Procchio: Hotel del Golfo: tennis court, tennis classes, swimming pool, just behind the beach. La Guardiola, Campo all'aia: beach restaurant, sailing club for children and adults. Marciana alta, Poggio: medieval villages up on the mountain with fantastic panorama and very good restaurants. Little airport in Acquabona, Island of Elba; big airport in Pisa 138 Km drive. Nearby Piombino, just before getting on the ferry in Piombino, you reach the beautiful long beaches of S.Vincenzo and Baratti. Up on the hills, behind Venturina, you can find Volterra, a rich roman town, in a very particular and charming location, with etruscan, roman, medieval buildings and early Christian churches. Island of Elba was part of the roman empire and you can admire ruins of roman villas in beautiful natural location. Portoferraio has been planned and builted by Cosimo de'Medici architect Giovanni Camerini as walled city and ruled by Medici for a long time. Then became part of Gran Ducato di Toscana, ruled by the Dukes of Lorena: you can admire Medicean fortress, Lorena castles, the two villas that belonged to Napoleon, as sovereign of Elba. Nature and history are melted in a incredible and fantastic way. Booking Notes: You should make a money transfer as indicated by the site, that include exclusively the rent and the site fees. Changeover day is mainly on Saturday. The guest shall arrive around 5 pm and leave the house at 10 am to make possible the house cleaning. The cost of the cleaning of the main house and the annexes is € 150 and € 100 if just the main house is occupied, the damage deposit € 200 ( it will be refund at the moment of your departure, less the cost of eventual damages), the fee for extra guest € 70/week and for the pet € 50/week, the cost for sheets and towels € 15/person ( beds prepared and towels in the bathrooms). These fees must be given directly to the house keeper Gabriella. Gabriella and Piergiorgio will wait for you in the house at your arrival to show you the house and they will be available for any problem occurring during your holiday. For the house guests the ferry company Blunavy offer a 20% discount on the roundtrip through a voucher that I will send you, if you are interested in. For a perfect holiday at the country house Tre acque a mosquitos disinfestation is realized each month for outdoor areas and inside with tablets, that is useful to lit around 6/7 p.m. In the main rooms there is a liquid propeller always on. The rental price of autumn, winter, spring price include heating.